Please welcome a guest blogger to Gluten Free Philly: my 8 1/2-year-old son, who has celiac disease. He just returned from Camp Celiac in Rhode Island, where he had a wonderful six-day experience in an all-gluten-free environment. (Detailed information about this year's menu is posted on the camp website.) 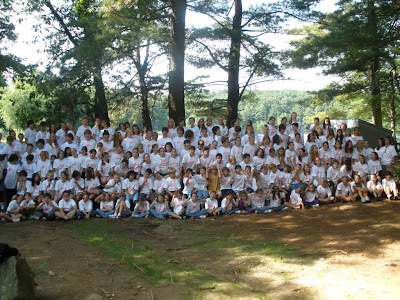 Camp Celiac has been held for the past 10 summers on the grounds of Camp Aldersgate in North Scituate, about 20 minutes outside of Providence. He wanted to write about his week away from home, so I'm turning today's post over to him. This was my first trip to Rhode Island. When I first got to camp, I thought, "Wow - that's a lot of celiacs." I was amazed. 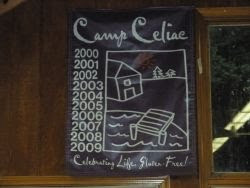 When we checked in, they gave me a cool 10-year anniversary Camp Celiac shirt. I met a lot of nice people in my bunk and the bunk next to mine. I was excited for all of the new foods I was going to eat. My favorite activity was fishing with Rod, the fisherman. I caught six fish: five pumpkinseed sunfish and one baby largemouth bass. I was shocked when I caught the bass. It was three inches long. We ate our meals at the camp mess hall. My first meal was turkey with gravy and rice, green beans and Chebe rolls. We had chocolate-chip ice cream with chocolate cones for dessert. The food only got better from there. We even went out one afternoon for lunch at Uno's Pizzeria. We had the whole restaurant to ourselves. 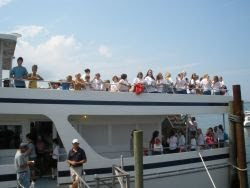 One day, we took a field trip to Cape Cod to whale-watch. We saw 65 whales and one baby seal. The kind of whales we saw were humpback whales and right whales. I liked dinner on the way back - we had GoPicnic boxes that had a turkey stick, a cheese stick, Sweet Surf gummy bears, snap pea crisps, sunflower seeds and applesauce. I also loved the Still Riding veggie and pepperoni pizzas, and also the hamburgers. I really liked meeting other kids that have celiac disease. It made me feel like I am not the only kid that has to be on a gluten-free diet. It was really nice to be able to eat the same food as everyone else. We were all telling each other about our favorite foods and restaurants. The last night, we went to a dance and made requests for different songs. The song I requested was the last one played, around midnight. I was sad when it was time to leave, but I was looking forward to going back home after almost a week away. I said goodbye to my counselor and the kids in my group. My dad picked me up and we drove to the airport in Providence to fly back home. While we were waiting for our plane, he taught me how to blow bubble gum. When I got home, there was a sign on the garage that said, "Welcome Home." Camp Celiac was a very big experience for me because it was the first time that I was away from home for that long. I was also happy to meet and hang out with other celiac kids. What an awesome experience. I have a few friends from college who have celiac disease that didn't know the others also ate gluten-free until about a year ago. When they finally realized they regretted not getting together to share food while they were all together in college. I'm also kinda jealous because I never went away to camp when I was a kid. Awesome job on the post, too; I hope you brought a long list of new foods home for Mike to write about! That is a great post. In our family we have an 8 and an 11 year old celiac. As their mom I am always a little worried when they are away from home eating. A week at camp seems daunting, but you have helped me see that maybe they will be able to go to sleep-away camp....maybe next year! Thanks for sharing your experience and I will be sure my daughters read your post too. It was great and will be again this year. As a counselor, I can attest to the powerful experience Michael wrote about. for kids to look around and realize they are one of 140 celiac kids and not to worry about food, for even a moment for 5 days is fabulous!